January and February were a big 2 months for us. We mentioned in December that 2016 was a big year for us and we’re happy to announce that we are all full time on Praey for the Gods! We’ve been discussing and planning to do this since November and working around the clock as we prepared to take the plunge and go full time with No Matter Studios and Praey for the Gods. Prior to our reveal trailer, we worked 10pm-2am every night. It was tough but manageable. However, after our trailer was released we quickly were dealing with a lot more than we could handle part time. We realized we need to be putting in much more development time. Currently, our efforts have been preparing our vertical slice build which we are still tracking well with. With the little amount of time that Tim and Chien have been working full time we’ve seen a huge upswing in our rate of development. With Brian just recently going full time we’ll definitely see an uptick in his productivity too. How are you going full time? Are you funded? 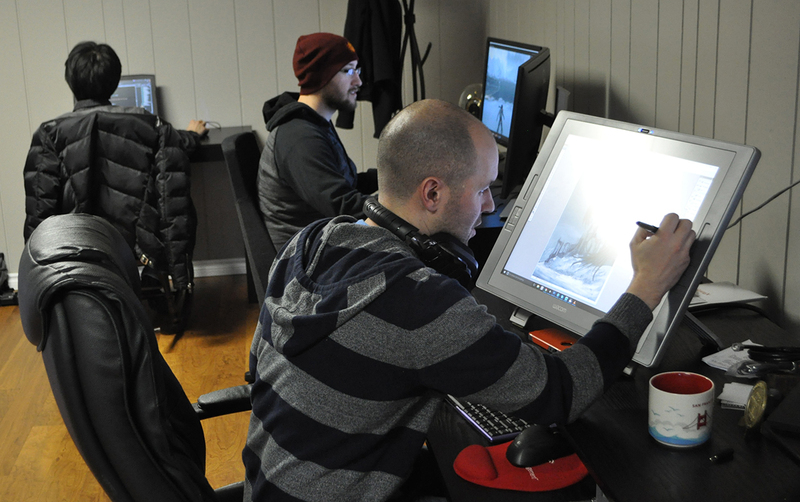 Chien, Tim and Brian are currently self funding the development of Praey for the Gods. Don’t you live in SF? How can you afford that?! Random photo of Seattle, WA. Thank you Google Image Search. That’s the other big news. We moved! No Matter Studios is now a part of the Greater Seattle game dev community. Since we won’t be taking a salary and working from our savings for now we made the decision to move as the cost of living is much more reasonable. Not to mention, there is a solid group of game developers both indie and AAA that we can work with in this area. All three of us had great jobs with great employers and we’re grateful that they were so supportive with all of this. Thank you Impulse Gear, and thank you FunPlus! 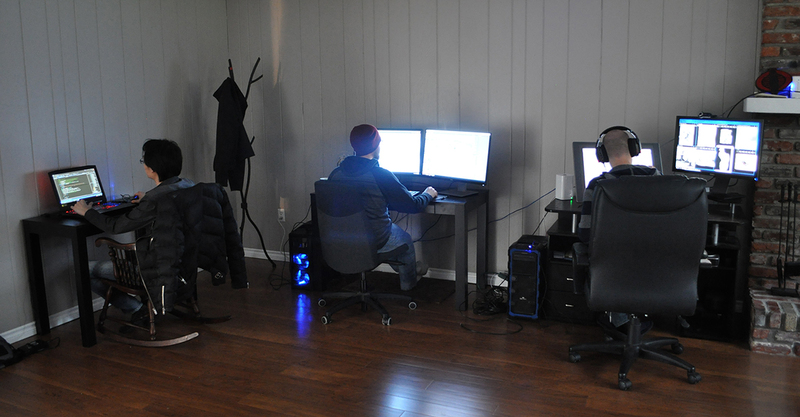 Chien, Tim, and Brian working away in the basement. An important part of going full time is being able to sit together as a team while we work. Prior to full time we’d meet Thursday nights to catch up with the work. We still do a lot of our work remotely but are now able to spend so much more time together as a team. Sharing ideas and troubleshooting issues happens much faster allowing us to be far more iterative and efficient with our prototyping. Brian concepting it up. Tim laying it out. Chien making it work. 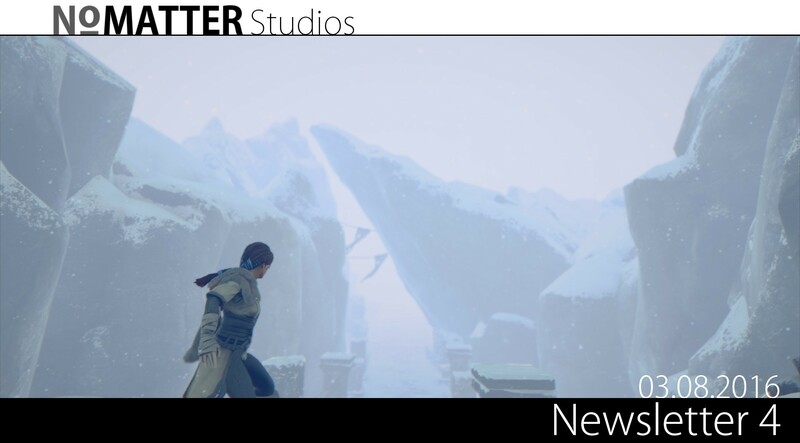 Previously, we had implemented the dynamic weather system. We also have gone back and adjusted the lighting system which is now much easier to work with. This allows us to create sunsets, blizzards, and night looks. All of which visually explain to the player the state of their environment. Another focus has been the refinement of our feedback on the player. As we continue to push for little to no UI we’ve realized that we need to be explicit with how the player is showing their state in the game. So things like stamina, hunger, cold and health are getting polished to better tell the player how they are doing. We’ve also been making some refinements to our climbing and character controller. It’s under the hood for sure, and the good news is that it’s feeling even tighter than before. Art wise we’ve been working on some new enemies both big and small. We’ll show them when they are ready but they are pretty sweet to see even in their WIP state. Best part is they are no longer red balls! We had a great Q/A session with OnlySP and another article from Golden Cartridge. Brian also sat down for a lengthy discussion with some old friends at the Character Art Podcast. He explains how he got into the industry and Praey for the Gods. January and February were a big 2 months for us. We mentioned in December that 2016 was a big year for us and we’re happy to announce that we are all full time on Prey for the Gods! We’ve been discussing and planning to do this since November and working around the clock as we prepared to take the plunge and go full time with No Matter Studios and Prey for the Gods. 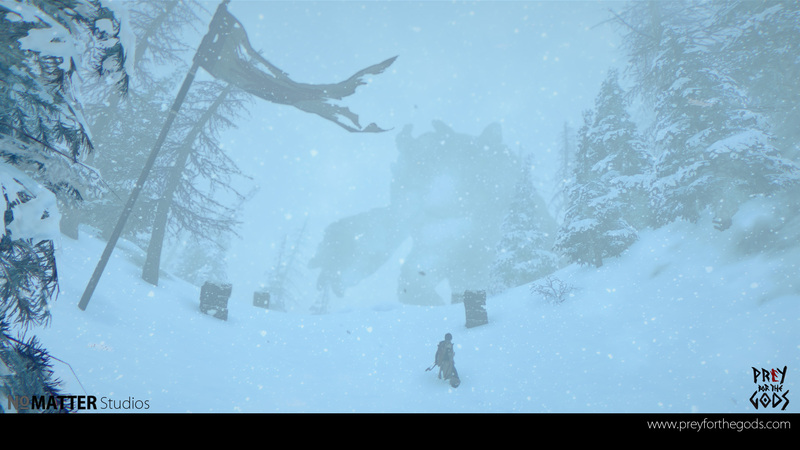 Chien, Tim and Brian are currently self funding the development of Prey for the Gods. We had a great Q/A session with OnlySP and another article from Golden Cartridge. Brian also sat down for a lengthy discussion with some old friends at the Character Art Podcast. He explains how he got into the industry and Prey for the Gods.